After showing a capacity crowd footage of Star Wars Battlefront, PlayStation's Adam Boyes showed off a new Darth Vader-modeled PlayStation 4 console. It's already been a huge weekend for the Star Wars franchise at this year's D23 Expo. So why shouldn't its most anticipated game be a part of the festivities. Star Wars Battlefront made an appearance during this year's Disney gaming panel, with panel attendees getting a fresh chance to check out the latest footage. But the big news came afterwards, with PlayStation's Adam Boyes revealing that a Darth Vader-modeled PlayStation 4 console would release in November as part of a bundle for either Battlefront or Disney Infinity 3.0. "The bundle also includes Star Wars Battlefront Deluxe Edition, as well as a digital voucher to download four classic Star Wars titles – Super Star Wars, Star Wars: Racer Revenge, Star Wars: Jedi Starfighter and Star Wars Bounty Hunter – playable for the first time on PS4, and sporting enhanced graphics and Trophy support," explains the PlayStation.Blog entry. The bundles are expected to launch on November 17. 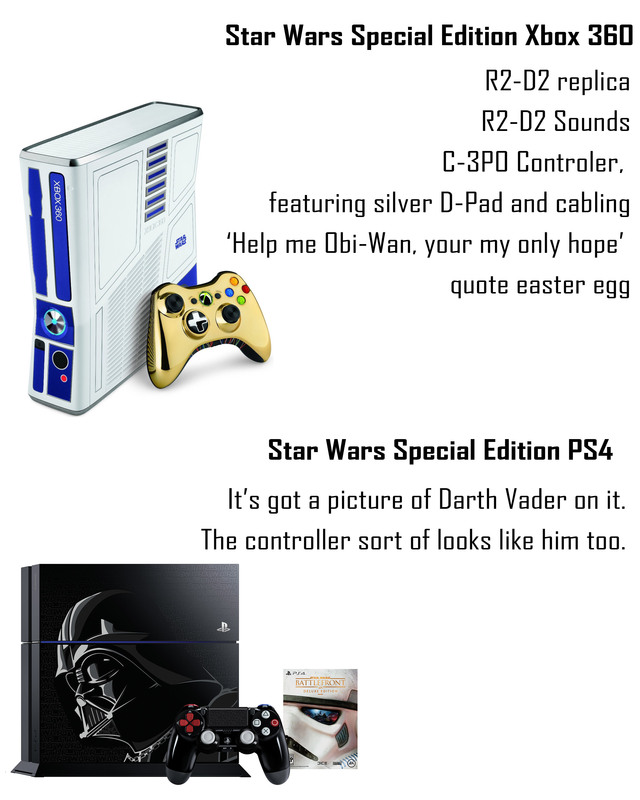 A Wal-Mart exclusive bundle with the Darth Vader-inspired 500GB PS4 system (CUH-1200 series), Dualshock 4 Wireless Controller, and the Disney Infinity 3.0: Star Wars Edition PlayStation Exclusive Hardware Bundle Kit will also be released on that day. I want that controller. Someone pointed out that it follows Darth Vader's control board's color scheme. Awesome. I love my R2D2 360. This... not so much. I want to. I keep thinking its about time to add the ps4 to the collection and a Star Wars themed model could be a tipping point... but probably not that one. Unless it has Darth Vader Breathing sound when turned on, then I might go for it. I kinda want the controller... but the console, not so much.